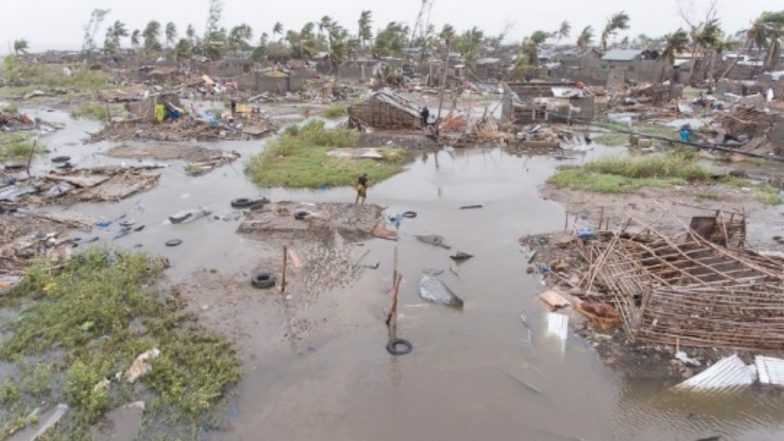 Maputo (Mozambique), March 18: With heavy winds and rains water gushing into Mozambique due to the Tropical Cyclone Idai, floods created by it have claimed almost 1,000 lives in the African country, suspects the International Federation of Red Cross and Red Crescent Societies (IFRC). However, President Filipe Nyusi informed that the death toll rose till 84 in Beira, but expects that 90 percent of the port city of Beira had been damaged or destroyed. Making a public announcement about the catastrophe, President Nyusi stated, as reported by Associated Press, “It appears that we can register more than 1,000 deaths. The waters of the Pungue and Buzi rivers overflowed, making whole villages disappear and isolating communities, and bodies are floating. It is a real disaster of great proportions.” Adding more he said that more than 100,000 people are at risk. Cyclone Idai: Death Toll Rises to 65 in Zimbabwe. According to the state broadcaster Radio Mozambique, as an aftereffect of Tropical Cyclone Idai, bodies of people were seen floating over rivers, and the scale of devastation is ‘huge’. IFRCRC suspects that due to the massive floods, around 5 lakh people have been affected. Since the electricity and all sorts of communications with the people were washed, the relief operations had taken a hit, and the international agencies have a tough time to help the affected people. With the Cyclone Idai travelled to Zimbabwe and Malawi, vast destruction is expected in these regions also. Medical units and relief providing agencies have called this an inter-national calamity, which needs to be dealt with utmost attentions. The Red Cross and the government officials claim that more than 215 people have been confirmed killed in the region and more deaths would soon follow when the water would recede. Reports also state over a hundred people are missing and more than 1.5 million people have been affected by the widespread destruction and flooding. LeSueur also added that the condition in Beira is disastrous, so their teams are operating from Mozambique’s capital Maputo Airport. He said, “Almost everything is destroyed. Communication lines have been completely cut and roads have been destroyed. Some affected communities are not accessible.” Adding more, he said, “Beira has been severely battered. But we are also hearing that the situation outside the city could be even worse. On Sunday, a large dam burst and cut off the last road to the city.” Cyclone Idai Hits Mozambique, Malawi, Zimbabwe, Killing Nearly 150. As the condition seems to be tense, international agencies are making all efforts to rescue as many people as they can and delivering food supplies and medicines by helicopter.